Professor James Hamilton (29th January 1918 – 6th July 2000) was an Irish mathematician and theoretical physicist. James (‘Jim‘) Hamilton was born in Sligo. His family moved to Belfast in 1920, where after attending the Royal Belfast Academical Institution, he entered Queen’s University in 1935. Following his graduation, Jim continued to work at Queen‘s University, and was the first fellow enrolled at the School of Theoretical Physics at Dublin Institute of Advanced Sciences. Much of his early research focused on the newly established field of meson theory. 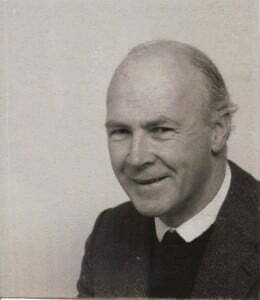 After service for the British Admiralty during the Second World War, Jim resumed his physics research at Manchester University and received his Ph.D. in 1948. He was then appointed lecturer in mathematics at Cambridge in 1950, where he emerged as one of the leading figures in S-matrix theory. Jim became well known for his sophisticated use of dispersion relations. In 1960 Jim was appointed professor of physics at University College, London and in 1964 joined the Nordic Institute for Theoretical Physics (Nordita) in Copenhagen, where he trained a whole generation of young Nordic physicists. Throughout his career Jim’s work was characterised by his conscientious supervision of students and fellows, and his kind and warm manner.